2 CDs: "The Etchings", "Empire," and "Au Pair"
A two-cd set continuation of the Milarepa saga, now on CD for the first time. The second opera in the "American Consciousness" quartet. 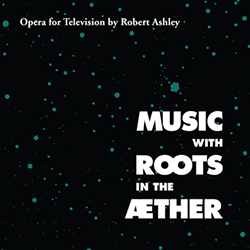 Robert Ashley's groundbreaking opera for televsion. Digitally remastered and released, finally, on DVD. Robert Ashley's opera, Celestial Excursions. Two disc package includes libretto in separate booklet. Jacqueline Humbert's solo CD, Chanteuse, of songs by Robert Ashley, Sam Ashley, Katrina Krimsky, Joan La Barbara, Alvin Lucier, Gustavo Matamoros, George Manupelli, Larry Polansky, David Rosenboom and James Tenney. Joan La Barbara's first vocal compositions, many originally released on LPs in the 1970s and early 1980s on her own record label, Wizard Records. The Lovely release uses the title of her first LP, Voice is the Original Instrument. The double CD release also includes never-before released works, Les Oiseaux qui chantent dans ma tete and Des Accords pour Teeny. "Blue" Gene Tyranny A CD of works for solo piano entitled, Take Your Time. Alvin Lucier, Still and Moving Lines of Silence in Families of Hyperbolas, CD 1015. Robert Ashley, In Sara, Mencken, Christ and Beethoven There Were Men and Woman, CD 4921. With Paul DeMarinis. Text by John Barton Wolgamot. DownTown Ensemble, DownTown Only, CD 3081. Chris Mann, the use, CD 3091. Alvin Lucier, Still Lives, CD 5012. Thomas Buckner, His Tone of Voice, CD 3024. 2000 Releases. . . .
Tom Johnson, An Hour for Piano, CD 1081. Gordon Mumma, Studio Retrospect, CD 1093. Robert Ashley's opera, Dust. CD 1006. Two discs, libretto booklet in slipcase. 1999 Releases . . . .
Alvin Lucier, Theme. Three new works, Music for Piano with Magnetic Strings, played by Lois Svard; Music for Gamelan Instruments, Microphones and Amplifiers, featuring the Wesleyan Gamelan Ensemble; and Theme (to a text by John Ashbery), featuring Sam Ashley, Thomas Buckner, Jackie Humbert & Joan La Barbara, voices. Two of Annea Lockwood's dramatic, electroacoustic works. The 1982 work, Delta Run, based in a taped interview with a dying man and Duende, 1998, written for and performed by Thomas Buckner. The works are each about 25 minutes long. They are for voice, pre-recorded or live, and taped sounds, "natural" or electronically generated, and they both deal with the issue of spiritual wholeness. Album title: Breaking the Surface, CD 2082. Lois Svard's second solo CD, Other Places is an exploration of Svard's interest in new concepts and ideas in music, this disc features works written for her by composers Elodie Lauten, Jerry Hunt and Kyle Gann. Released in January 1998. Leroy Jenkins' new release, simply entitled, Solo, is a live recording of a magical violin/viola performance at the Contemporary Arts Center in Santa Fe. The entire concert is contained on the disc. The CD will include 7 of Leroy's works, with the addition of Dizzy Gillespie's "Wouldn't You" and John Coltrane's "Giant Steps." May 1998. The works on baritone Tom Buckner's third solo CD, entitled Inner Journey all deal thematically with a quest for acceptance and self-knowledge. Works by William Duckworth, Tom Buckner, Jacques Bekaert, David Wessel and Somei Satoh. Delivered in June 1998. Lovely has reissued Eliane Radigue's first LP, Songs of Milarepa on compact disc. Two never before published songs have been added to the original pair, and with the addition of the 60-minute, Mila's Journey Inspired by A Dream, Radigue's five-song cycle is complete in this double CD package. Released in February 1998. John Cage's monumental piano work, Music of Changes was delivered in May 1998. Musicologist John Holzaepfel says in his notes that this work "heralded a new concept of musical time, placing the performer in a new relation to the score, one in which orientation is to the occurrence of events rather than to the relations between them." Joseph Kubera is among the few pianists to have assayed the obstacles posed by its innovations since David Tudor ceased playing the piece in the late 1950s. This recording is the first since Herbert Henck's, on Wergo, from the early 1980s -- and it pairs an extraordinary performance with digital recording quality!